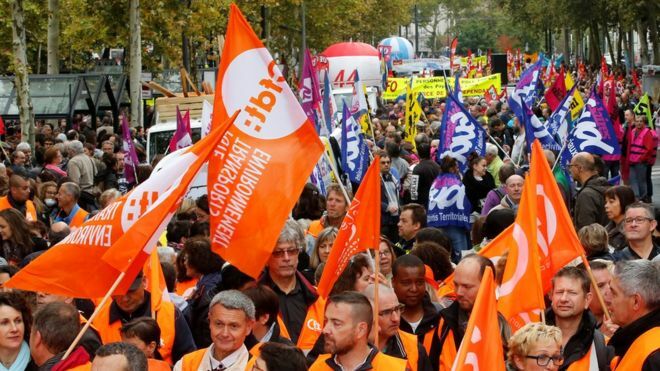 Millions of public sector workers in France are taking part in a nationwide one-day strike in protest at President Emmanuel Macron's economic reforms. The action has closed schools and disrupted train services and about a third of flights have been cancelled. The French government plans to cut 120,000 public sector jobs in France over the next five years. Last month, thousands of people demonstrated in Paris at Mr Macron's overhaul of France's labour laws. The nationwide strike on Tuesday, called by all nine of the country's public sector unions, was organised to show solidarity against the job cuts and further plans to freeze pay. The unions, which represent 5.4 million public workers, said the demonstrations would send a message of their "profound disagreement" with Mr Macron's plans. 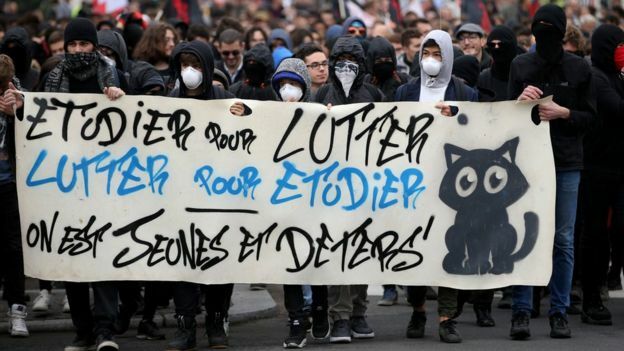 Marches have taken place in major cities including Nantes and Lyon, with a procession due to begin in Paris at 14:00 local time (12:00 GMT) from the Place de la République. Two of France's biggest unions, the CFDT and Force Ouvrière (FO), have given their support to the industrial action. 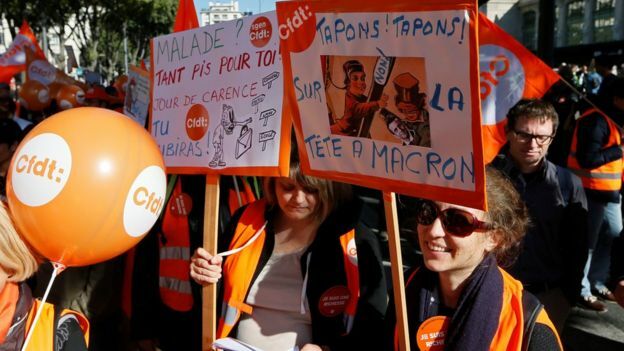 Laurent Berger, who heads the CFDT, told French news daily Les Echos that the country's public sector was "suffering" from "budgetary constraints". "The government does not seem to have taken the full measure of the deep malaise among civil servants," he said. 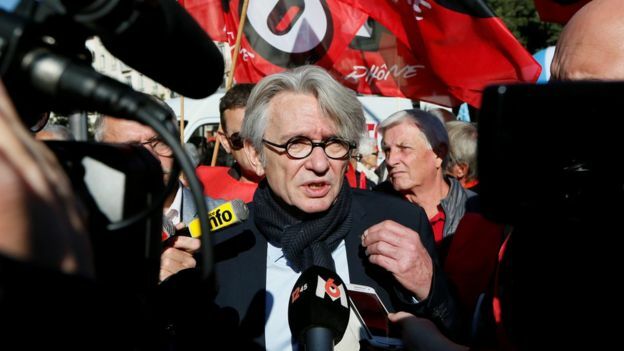 Jean-Claude Mailly, the leader of the FO union, also joined demonstrators as thousands marched in the city of Lyon. While Mr Mailly did not back last month's protests, his union said that it "fully supports" those taking part in Tuesday's nationwide strikes and "will demonstrate in defence of their rights, their statutes, their purchasing power and their pensions". Speaking in Lyon on Tuesday, Mr Mailly said that Mr Macron's "strategy of austerity" will end up "calling into question the very existence of public service". He said he was concerned about the possible transfer of services, such as nurseries and hospitals, to the private sector, adding that further demonstrations were being planned for next month.